I'm not going to spend much time on an intro this month. Because...we have so many great reviews for you. I know your time is precious, and I don't want to take it up with bits of trivia about March. Not when you can read our reviews and discover new books to add to your TBR pile. Enjoy! With the exception of her picture books, I've read all Meg Rosoff's books, and the experience is always beyond enjoyable. The woman can write; there's no two ways about it. Each novel is filled with what I call "literary gems." You know, those insights that are so perfectly captured, the sentences echo in your mind after you've closed the book. In Picture Me Gone, 12 y.o. Mila and her father, Gil, travel from London to upstate NY to find her father's oldest friend, Matthew, who has gone missing. Now, Mila is no ordinary girl. She can "read" people. She senses what others, including a baby and a dog, are thinking or feeling and can suss out a situation like nobody's business. One review described her as a mentalist, and that's as good a description as any. The characters are quirky, but still very real. The various relationships between them are complicated and interesting. The author is a master at revealing just the right amount of information at just the right time. The banter is pitch perfect between Mila and Catlin, her friend with a messy home life. The one stumbling block I had is this: Our uncannily perceptive Mila gets tricked. Someone close to her keeps a huge secret from her, and she doesn't suspect it for many, many pages. I don't know that this is an inconsistency. I can just say that it struck me. 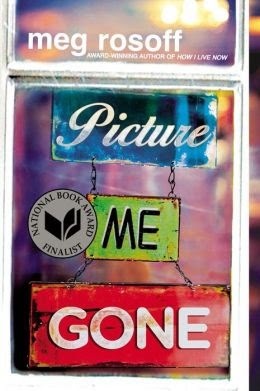 Picture Me Gone is beautifully written. On several occasions, it kept me on the treadmill for well past 30 minutes. And this is no mean feat! Highly recommended. Dear FCC: Bought this book. Listened to it in my car. On the elliptical. On the treadmill. That's all I have to report. Goodbye. A warm welcome to Ray Pothoff, a brand new reviewer. And welcome back to the fabulous Beth Bonini. We are very happy to have you both with us. Very happy. I've read a few books recently by Sarah Addison Allen which all contain an element of magic, and was surprised to find I enjoyed them. Mila sounds like an interesting character and the book a fun read! Now to check out the other reviews--I have been devouring books during this long winter and need some new choices! Great review. I'll have to consider getting this for the 11-year-old. It sounds like her kind of book. As always, a good review with an interesting premise. I forgot it was Wednesday so posted my review a little late but it is up now! Whoa--extra time on the treadmill! High praise indeed. I'll definitely have to grab this one. Thanks, Barrie! I really enjoyed this book, too. I felt that "being tricked" was the whole point. It just heightens the betrayal because it hurts the protagonist in the very place that she had prided herself (paying close attention; deductive reasoning). It's got a very strong "coming of age" theme: having to learn that parents aren't always so strong or honest or admirable. And yet Mila's father is wonderful compared to the other fathers on display! Certainly his crime of "withholding information" was committed for all the best reasons. Thanks for the warm welcome, Barrie! Wow, this is a good turn out! Thanks for hosting! I read Rosoff's How I Live Now and it was beautifully written but disturbing. Yes, I can see how that inconsistency works against the framework. You are so good at plot analysis. Secondly, I would definitely be bothered by the point you mentioned, but this sounds like a good book nonetheless. And yay for staying on the treadmill!! This sounds really good, Barrie. Thanks for the review. Welcome to Ray and Beth!